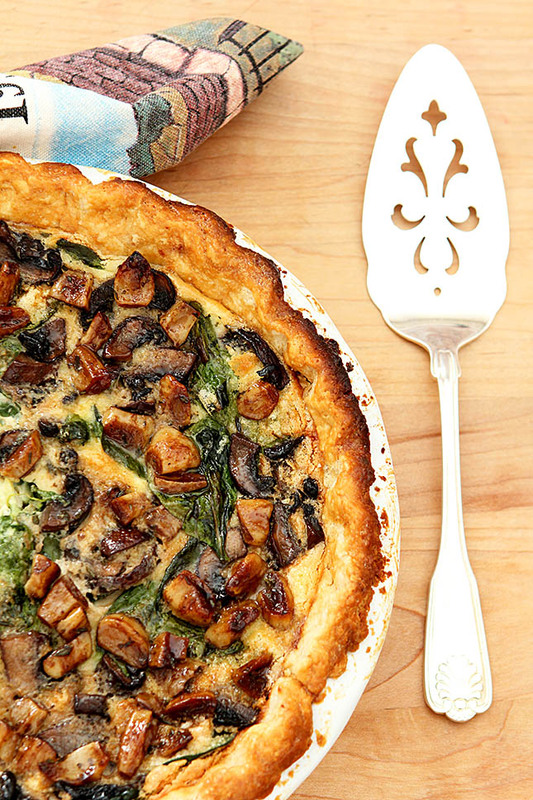 Call it a tart or call it a quiche, as long as you call this Caramelized Garlic, Spinach and Mushroom Tart good. Plus, there isn’t a real man I know who would pass this up, it’s absolutely divine! I used to regularly make recipes from the pages of Bon Appetit Magazine, most often from their RSVP section where they share restaurant recipes requested by their readers. But I’ve gotten out of that habit; mostly because I have yet to catch up with the pile of magazines I never read when I was in my period of ‘housing transition’ (sounds so much better than saying homeless doesn’t it?). That was FOUR years ago! Technically not really homeless, I did stay with some friends after my house sold and I had to wait for my new home to be complete but the room I as in was simply not conducive to reading so the pile grew each month. When I moved here I had the best of intentions. But you know how a move is…the first few months were so hectic; more magazines kept coming and I always have way too much on my plate anyhow so I’m thinking I have to concede that I’ll never catch up! Still as I was sorting through them and putting them in boxes recently, I did spy this February 2015 issue and as much as I love the RSVP section I got no further than the front cover. Everything I love in one dish so how could I not make February’s Caramelized Garlic and Spinach Tart? In my kitchen though ‘Modifications R Us’ is always the trend so the package of mushrooms in the fridge that were crying to be used turned the Bon Appetit tart into a Caramelized Garlic, Spinach and Mushroom Tart and it was absolutely, completely and divinely divine! Though they called this a tart, I probably wouldn’t. I’m not quite sure what the difference is but it has all the components I expect in a quiche; eggs, milk and cheese. But to make certain, I did reference descriptions of each dish and truth be told it could be called either. 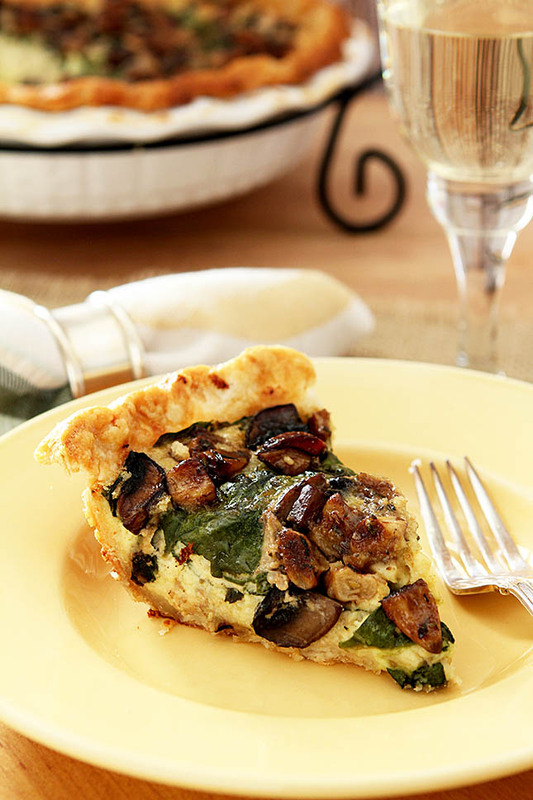 Quiches are savory and include milk, eggs and cheese; tarts can be sweet or savory and the addition of those three elements is not mandatory so in my book I would still say quiche but I’ll acquiesce to BA; it was after all their idea! The cover photo included a very cool braided decoration for the crust. My first thought was, ‘how pretty’ followed by my second thought of ‘you must be kidding!’ It looked perfect but I could not figure out how they got it too look SO perfect since the braids were in three pieces and would have to be combined together as it roped around the pie plate. I’m betting it was the magic of Photoshop and I knew I didn’t want to go down that rabbit hole so it was plain old regular crimped crust for me and no regrets! If the thought of a head of garlic scares you; don’t let it. As the garlic is cooked it softens and not only is the potency lost but it develops a beautiful sweet flavor; much like what happens to onions. This is one dish I did not share; nope…it was MINE ALL MINE!! I highly suggest you make this for yourself too. Better not invite me over. Place a rack in lower third of oven; preheat to 350°. Roll ou disk of dough on a lightly floured surface to a 14" round. Transfer to a 9"-diameter pie dish. Lift up edge and let dough slump down into dish. Trim, leaving about 1" overhang. Fold overhang under and crimp. Freeze 15 minutes. Line dough with parchment paper or foil, leaving some overhang. Fill with pie weights or dried beans. Bake until crust is dry around edge, 25-30 minutes. Remove parchment and weights and brush entire crust with egg. Bake until crust is dry and set, 10-15 minutes. Let cool. Meanwhile, cook garlic in a medium saucepan of boiling salted water until beginning to soften, about 3 minutes; drain. Wipe saucepan dry and heat oil in pan over medium-high. Add garlic and cook, stirring occasionally, until cloves start to turn golden brown, about 2 minutes. Add vinegar and 1 cup water and bring to a boil. Reduce heat and simmer until garlic is tender, 10-12 minutes. Add maple syrup, rosemary, and thyme, and season with salt and pepper. Cook, stirring occasionally, until liquid is syrupy and coats garlic, about 5 minutes. Melt butter in a skillet; add sliced mushrooms and saute until juices are released and starting to brown. 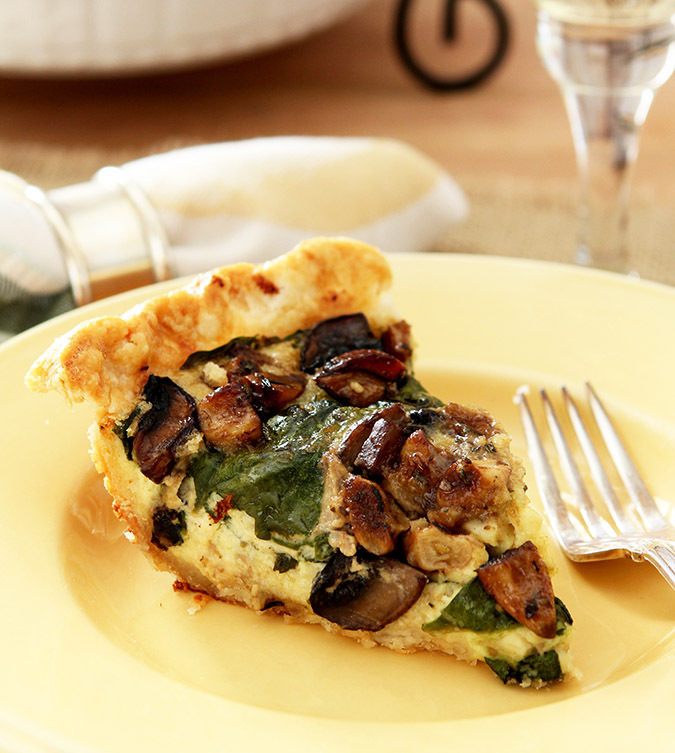 Scatter cheese over crust; top with spinach and mushrooms. Whisk creme fraiche, cream, and remaining eggs in a medium bowl; season with salt and pepper. Pour over spinach. Scatter garlic on top with any syrup. Bake until custard is set and golden brown in spots, 35-40 minutes. Let cool on a wire rack. The recipe specified using one portion of the dough for the crust and the other for the trim that I did not make. I just made some pie dough cookies and no one complained. No one at all! The link to the Nutritional info is broken, please fix this. I would like to make this but really want to see the Nutritional Info. Thank you! I had not purposely setup my site to display nutritional info because the software included in my recipe card info has some glitches so I was surprised to hear that a link was broken. Son of a gun…another plugin I was asked to try to include my recipe online in their database inserted that code without my knowledge so I have no idea why it’s not working but even worse for me; I had no idea they were doing that so I’ve deleted that plugin and process entirely. Sorry for the confusion. I’m not yet at a place to include this information for recipes I post as I simply do not have the manpower available to find the correct data for 1000 recipes that my site includes. What software I have tried has failed miserably as I need something automated to manage this data. There are several nutritional calculators you can find online to help you with this information for individual recipes if you want to gather that information for yourself for a particular recipe. I hope that helps! Tart/Quiche/Pie/Whatever — I’d call it dinner! Love scrumptious dishes like this — just loaded with flavor. Good one — thanks. I do too John…quiche has been and will forever remain one of my favorites; it’s easy and so versatile and delicious…win win all around! The “Notes” are where? This looks terrific. One of the best ever John; so much garlic that became so sweet and mellow. Perfect even.